Home-cooked baked macaroni or Chinese-style lumpia, anyone? (SPOT.ph) We know, we know: Pizza and wings are great when you’re hanging out with friends at home. But sometimes, it’s hard to beat a good ol’ home-cooked potluck—remember when your friend’s mom used to cook for your study group? When it’s too much of a hassle to cook the food yourselves, just remember there’s always Plan B: Party platters. These 10 home cooks can whip up tasty potluck meals with just a few taps or a quick dial on your phone—you’ll never know when you need them. Wok with Mom has all kinds of traditional Chinese dishes to spice up your dinner. Founded by Gemma Lim (or “Mom”), the food-delivery service is now being handled by her daughter Oi Lim. The best-selling Eight Treasure Stuffed Chicken (P1,580) is a hefty dish fit for five to 10 people, which features a whole deboned chicken stuffed with an assortment of “lucky” ingredients like sticky rice, mushrooms, lotus seeds, and scallops. Celebrating a special occasion? 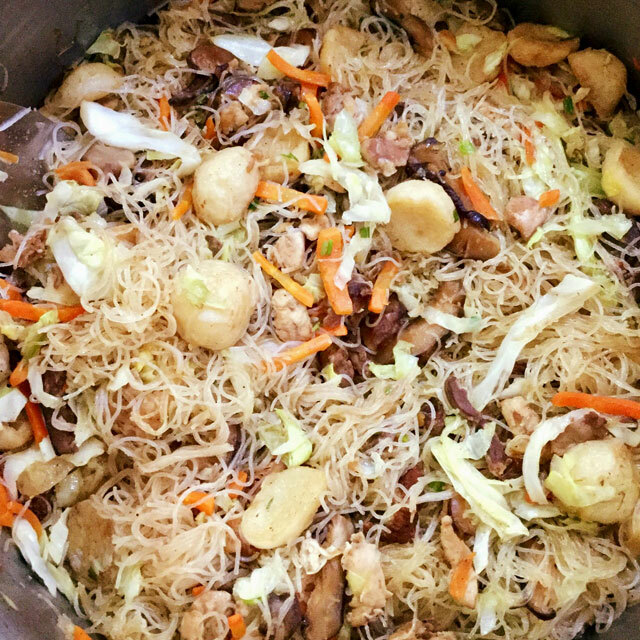 Their Long Life Bihon Noodles (P880) is a no-fail party favorite. For more information, log on to Wok with Mom’s Facebook page or contact 0917-866-3562. You might want to put Gabe’s Homegrown Dishes on your speed dial, stat, for last-minute party preps. Their Baked Macaroni (P1,200/10 to 12 people) is a no-nonsense version of your favorite comfort food, and it’s sure to remind you of childhood merienda at your school canteen. 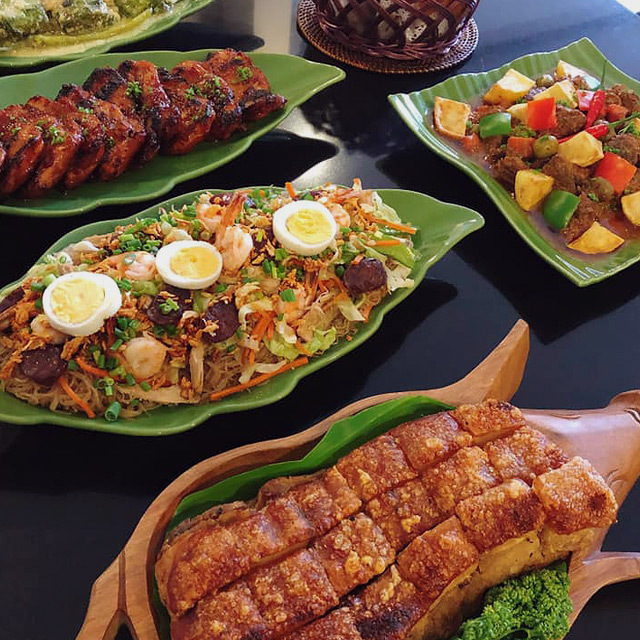 The indulgent Lechon Kawali (P1,000/10 to 12 people) can make any carnivore happy, but if you’re more into seafood, then their buttery Salmon Belly with Béchamel Sauce (P1,500/10 to 12 people) will not disappoint. Gabe’s Homegrown Dishes is at Cauliflower Street, Quezon City. For more information, log on to Gabe’s Homegrown Dishes Facebook page or contact 439-2093. Any party instantly becomes better with good, satisfying food—and that’s exactly what you’ll get with Beng’s Home Kitchen. Some of their crowd favorites include a tray of classic crispy Chicken Tenders (P1,500/12 to 15 people), which comes with a tangy honey-mustard dip. Their Meat Lasagna (P1,500) isn't one to be scoffed at—plus the dish comes with crunchy garlic-parsley toast. For dessert, you can’t go wrong with Lemon Squares (P400/16 pieces), a zesty-sweet pastry perfect for sharing. For more information, log on to Beng’s Home Kitchen Facebook page. 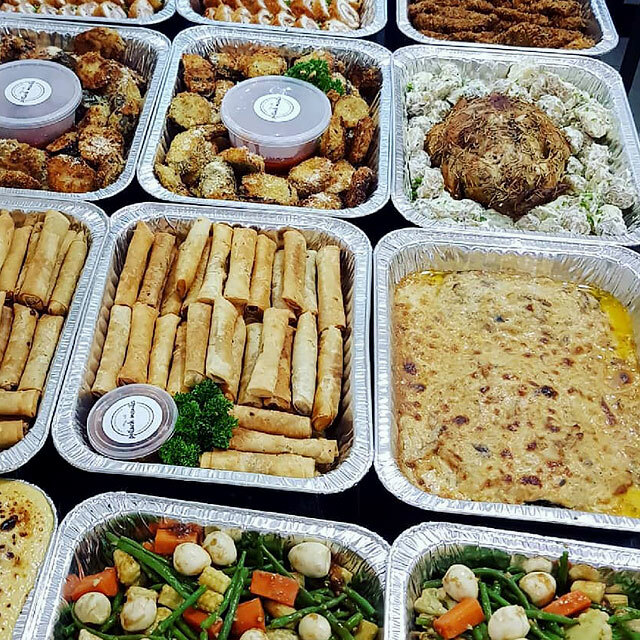 If you live in the south of the Metro, then you’re in luck because Food Trays Online delivers in your area. 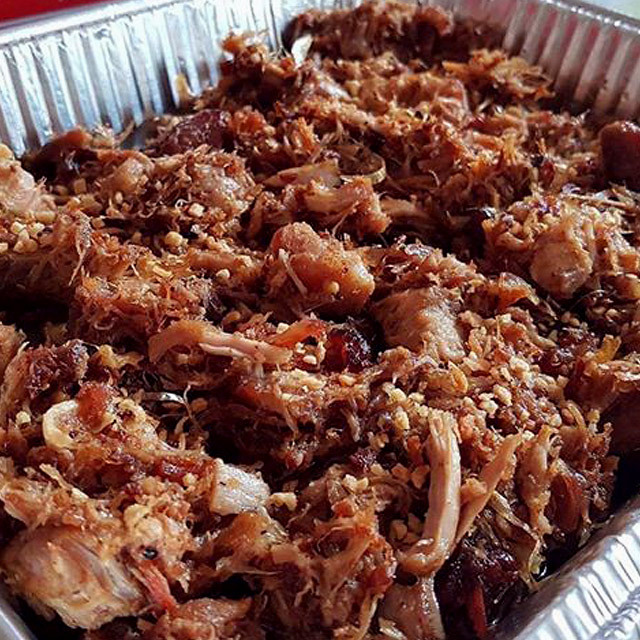 Order a hefty tray of their crunchy and indulgent Pork Sisig (P899/12 people, P1,499/20 people, P1,999/30 people) on your next get-together, or some refreshingly citrusy and savory Lemon Chicken (P999/12 people, P1,599/20 people, P2,199/30 people) when the chicken hankerings kick in. Or go for the classic Sweet & Sour Fish Fillet (P799/12 people, P1,399/20 people, P1,899/30 people) to get a flavor of home. For more information, log on to Food Trays Online Facebook page or contact 0917-897-9494. 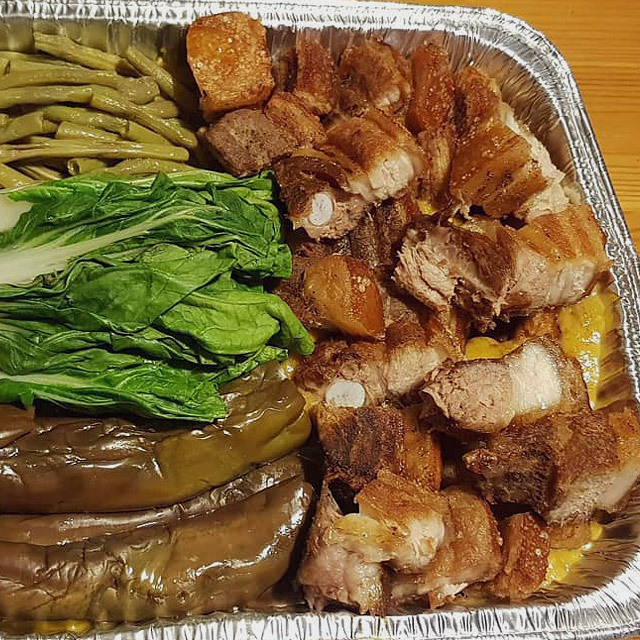 From traditional Filipino meals to comforting Asian or American dishes, Potluck Manila has them on their menu. The Chicken Cordon Bleu (P1,350/10 people) is a delicious take on the classic and well-loved chicken meal. It’s also hard to go wrong with their best-selling Roast Beef in Cream Sauce (P1,750/10 people), with fork-tender beef slathered in a savory cream sauce. Got a party of seafood lovers? You can’t miss the no-frills Prawns in Aligue Sauce (P1,850/10 people)—it's sure to hit all the right notes. Potluck Manila is at Coronado Street, Mandaluyong City. For more information, log on to Potluck Manila Facebook page, or contact 0917-321-8108. Lush Plates’ potluck menu has got you covered on pretty much anything you and your friends might be craving. You can get a generous and satisfying tray of Beef Kare-Kare (P1,350/10 to 12 people, P1,700/16 to 18 people) with their homemade bagoong. 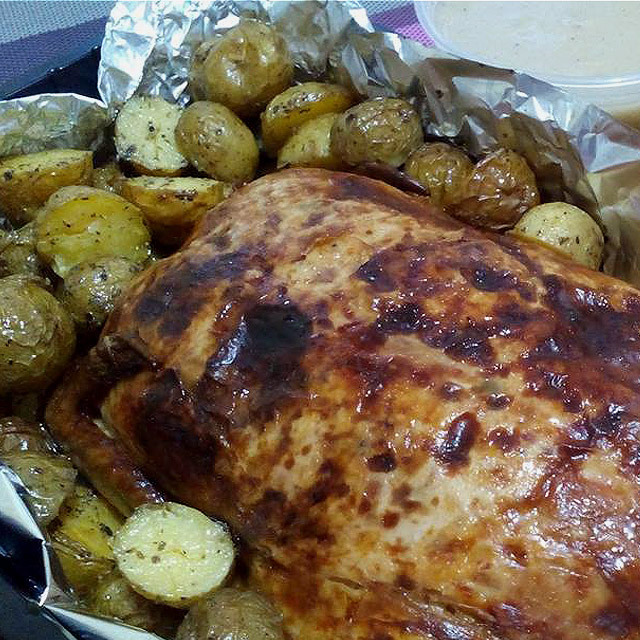 Another party staple is the Chicken Galantina (P1,400/15 to 20 people), which comes with a side of gravy and marble potatoes. If you want to sprinkle something out-of-the-box into your potluck, their Chicken Biryani (P1,600/10 to 12 people, P2,200/16 to 18 people), served on fluffy basmati rice and tzatziki, might just end up being everybody’s favorite. For more information, log on to Lush Plates Facebook page or contact 0929-331-3280. 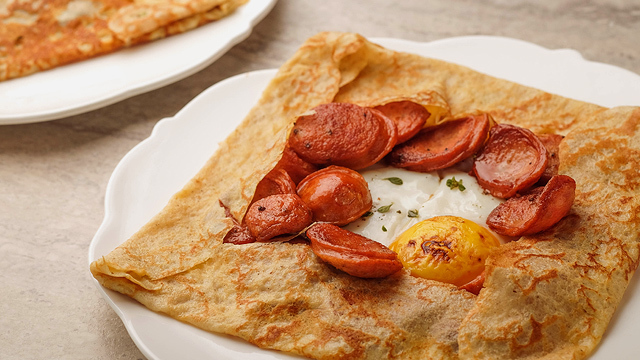 You can get a lot of familiar comfort dishes here, and even food you would rarely find in the Metro. 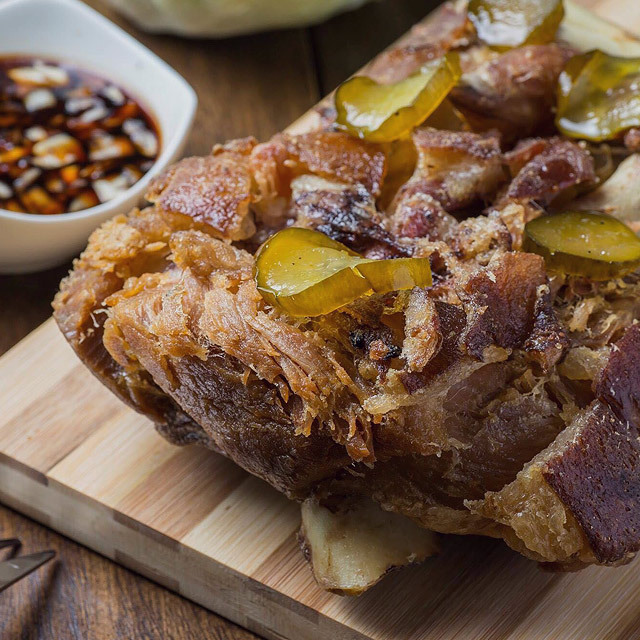 For example, there’s the crispy Roasted Lechon Belly (P2,950/10 to 15 people, P4,900/15 to 25 people) with spicy vinegar sauce, which is great with cold beer. 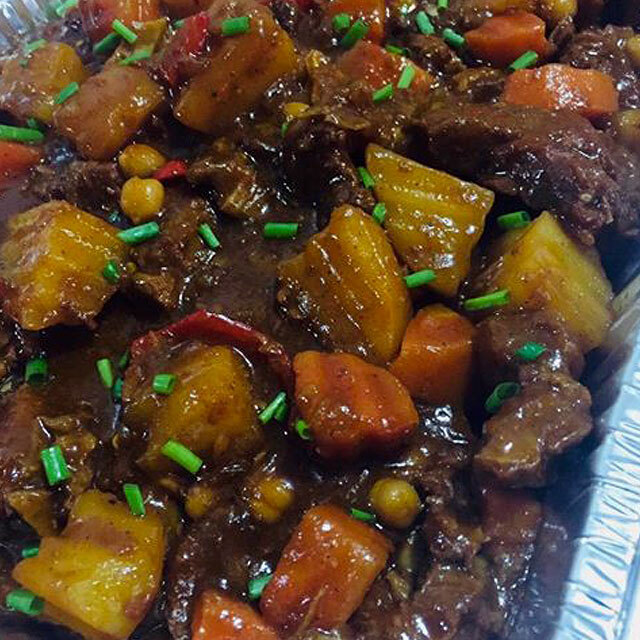 Meanwhile, they also have Kapampangan favorites, like Adobo Sulipan (P2,050/10 to 15 people, P3,850/15 to 25 people), a rich and meaty stew simmered in a perfect blend of vinegar, garlic, and peppercorns. Want to try something new? We recommend their crowd-favorite Caviar Pie (P2,050/10 to 15 people) for when you and your crew are feeling fancy, with a bed of indulgent fish roe or caviar on top of egg, cream cheese, parsley and onions. 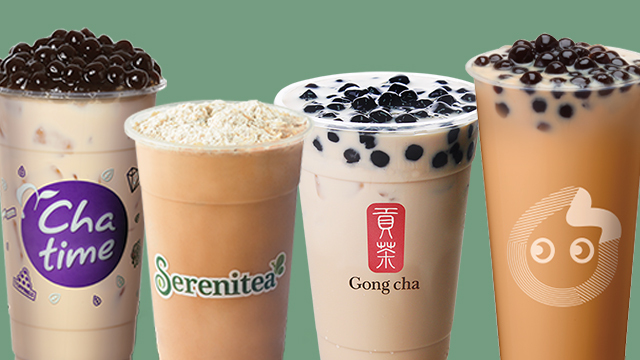 Munchies Manila is at Food Terminal Inc. (FTI), Paranaque City. For more information, visit the Munchies Manila Facebook page, or contact 776-9117. What’s a potluck without proper pasta? The Bearded Chef PH is popular for their homemade pasta dishes, like the cheesy and beef-laden Meaty Lasagna (P650) or creamy Classic Carbonara (P550), while their Crispy Pork Sisig (P650/six to eight people, P1,300/12 to 15 people) is never a bad idea, especially for meat-loving sisig fans. For more information, log on to The Bearded Chef PH Facebook page or contact 0928-296-5544. When you haven't got any time to whip something up for that get-together, check out Your Kitchen Guy. Some of their crowd-favorite dishes include the Beef Kebabs (P699/eight to 10 people), perfect as an appetizer or main course. 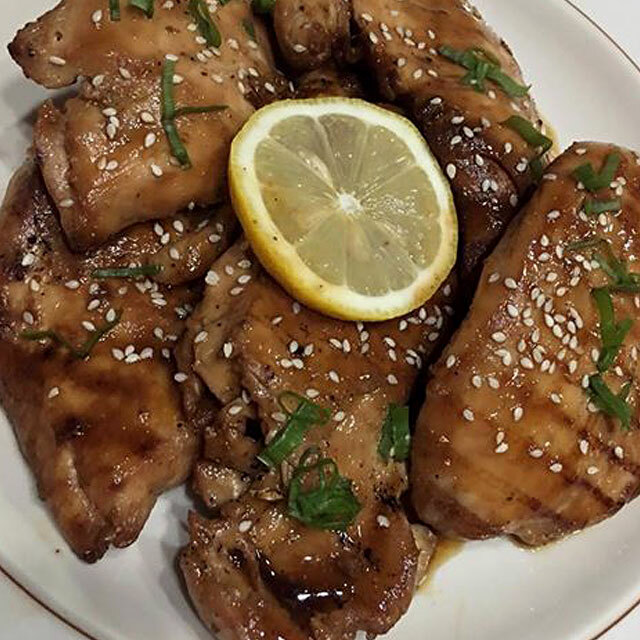 The Chicken Teriyaki (P699/eight to 10 people), on the other hand, is made with a signature savory-sweet sauce that’ll leave you licking your plates clean while the Smokey BBQ Ribs (P749/eight to 10 people) is a lip-smacking, cannot-miss dish for certified meat aficionados. For more information, log on to the Your Kitchen Guy Facebook page or contact 0917-948-0527. 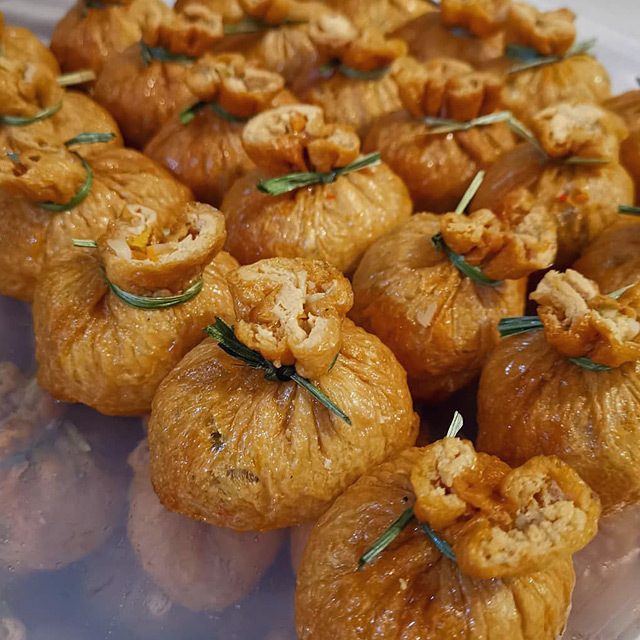 If you’re wondering why you’re suddenly seeing a lot of fortune bags (the food kind) and curry crabs on your IG feed, it’s probably because of China Mommy, a popular source of homemade Chinese gourmet dishes in the Metro. 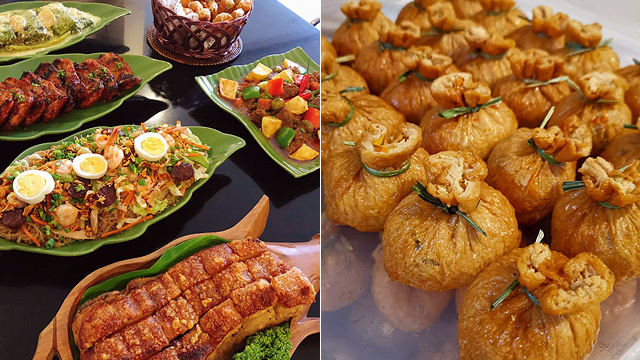 Their Special Chinese Lumpia (P2,800), for example, gives you all the ingredients you need to make your very own fresh lumpia, while the Fortune Bags (P1,600), with ground meat and veggies encased in a delicious tofu-skin wrap, has a sweet aftertaste that’ll leave you reaching for more. For a really special meal, choose from their many crab dishes on the menu. We recommend the Crabs in Special Curry Sauce (P6,700), made with secret spices that really bring out the delicate flavor of the sweet crab meat. China Mommy is at Jade Drive, Barangay San Antonio, Pasig City. For more information, log on to China Mommy’s Facebook page, or contact 0917-514-8540.